As I stated in my last post, I was in Lynchburg all weekend celebrating my sister getting married. The weather was less than ideal on Friday and most of Saturday but that didn't stop us from having fun and enjoying the moment. It was a busy weekend that is leaving me still catching up on sleep, however I am still so happy with all the quality time I was able to spend with family. This was the outfit I wore for a casual bridal brunch on Friday before the rehearsal dinner. A wonderful friend of my sister's offered to host us in a beautiful home that overlooked all of Lynchburg. We ate, we laughed, and shared funny stories. 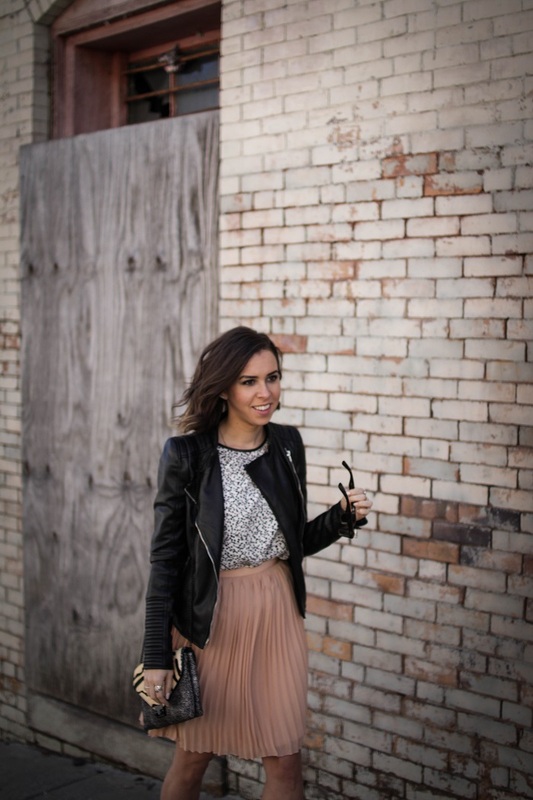 I wanted to be girly but nothing too crazy or formal so I opted for my faux leather jacket (which I force to go with everything) and this girly pleated J.Crew skirt. Since the weather was warmer, but still not too warm it was the perfect outfit. 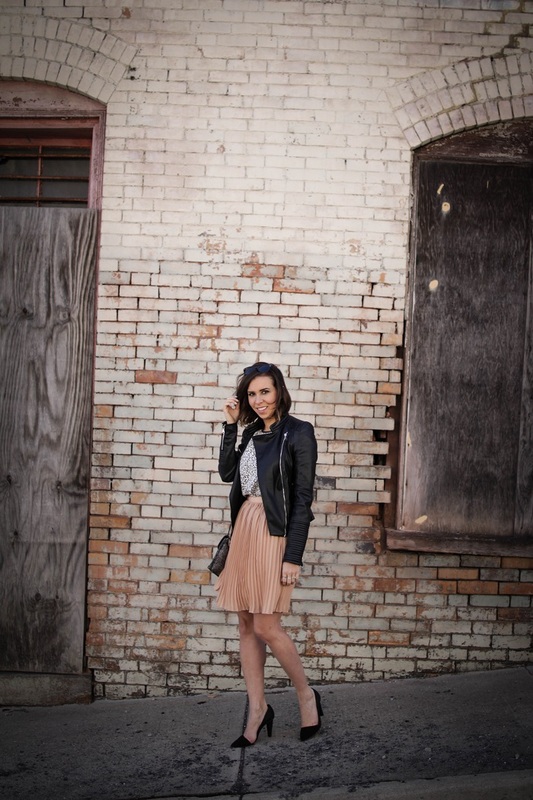 I love the mix of feminine details (skirt) with the leather jacket! Seriously so gorgeous! I love the blush skirt with the printed top and your black accessories. You just always look so effortlessly cool and chic. This is a stunning outfit! I love the girly skirt and edgy jacket combination. 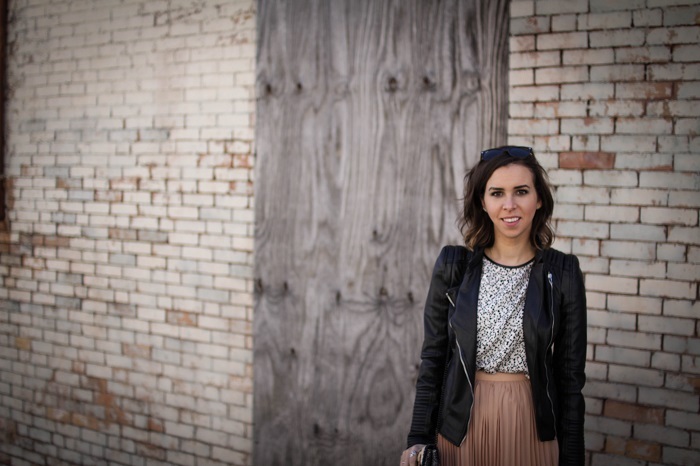 Leather jackets are always that perfect addition to make an outfit more casual. Awesome look, lady! I love a girly piece with something tougher, like this amazing leather jacket. First things first, you are gorgeous. Second, I love this outfit. The skirt is pure magic, perfect for a casual brunch. What a great look. I like the mix of soft feminine texture, styled along side of much harder skins. You look adorable. Might I add, accordian pleats are my favorite. Great styling. Very pretty ensemble!! Like it a lot!